Nature is inhabited by an incredible number of plant and animal species. A major component of this biodiversity is the tremendous amount of plant-feeding insects. But why and how? Our paper ‘Unifying host-associated diversification processes using butterfly-plant networks’ can be found here. Nature is inhabited by an incredible number of plant and animal species. A major component of this biodiversity is the tremendous amount of plant-feeding insects. Evolutionary biologists have been trying to explain the origins of the diversity of plant-feeding insects for over 200 years, but differences in research focus resulted in a quite divided field. This division was noticeable even within our department at Stockholm University. 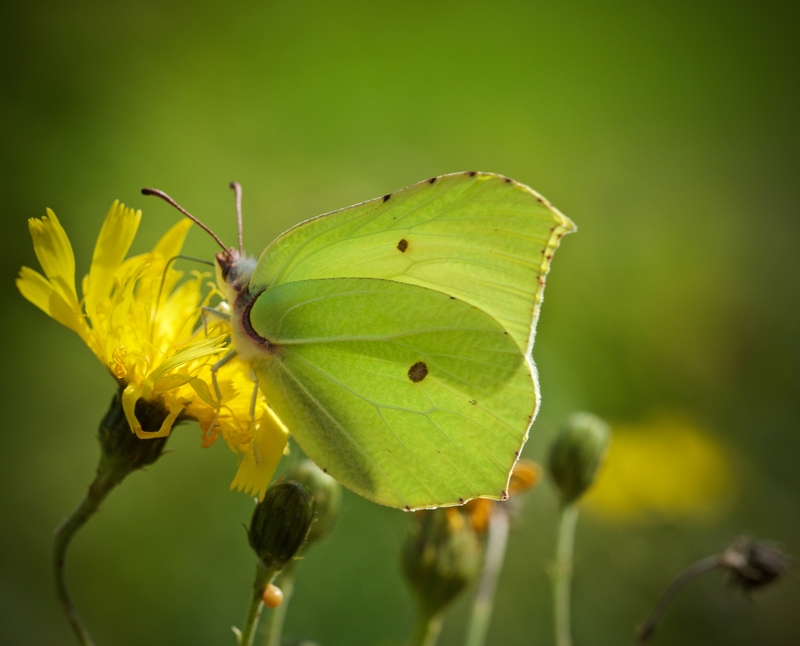 Christopher Wheat, a co-author of this paper, has studied mainly Pieridae butterflies, focusing upon the arms race between them and their chemically well-defended Brassicales hosts (cabbages and mustards). His research has primarily investigated the coevolution between these two groups, developing macroevolutionary scale and mechanistic insights into the work started by Peter Raven and Paul Ehrlich, who wrote the classic and very influential paper about coevolution in 1964. Their hypothesis suggests that the diversity of plants and their feeding insects is, at least in part, the result of an arms race where plants sometimes come up with new defenses against insects, allowing them to diversify due to reduced herbivore pressure. However, sooner or later an insect will “crack” these new defenses by evolving a key innovation, in turn allowing these herbivores to diversify upon these novel plant resources. Gonepteryx rhamni (Pieridae). Photo by Niklas Janz. An alternative explanation was proposed more recently by Niklas Janz and Sören Nylin, who have studied Nymphalidae butterflies for many years. 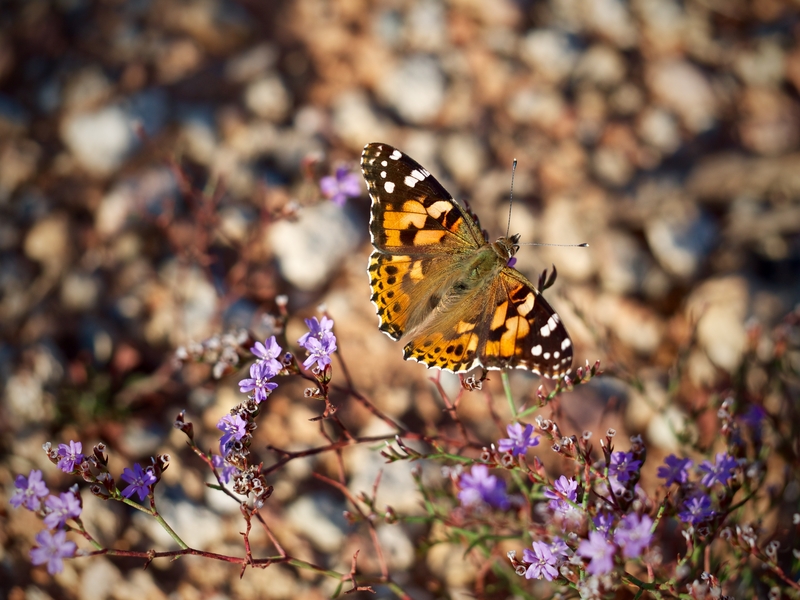 One of the special things about these butterflies is that, overall, they use a number of different plants as hosts for their larvae, but the number of hosts used by each species varies a lot. So their research has focused on the causes and consequences of such variation, which led to the hypothesis that insects can keep abilities to use host plants that their ancestors used in the past, and this variability in host use capacity allows them to explore and exploit the environment in new ways when conditions change. Such explorations of available hosts have been suggested to work like a diversification engine by repeatedly breaking up widespread species – using several host plants – into smaller specialized populations. The co-author I have not mentioned yet is Paulo Guimarães, aka the network guy. I took a course with him a few years ago in Brazil and since then I’ve been hooked on network analysis. It’s a really interesting way to depict and extract information from a complex system. I had a hunch that the two hypotheses I introduced above should produce different network structural patterns. 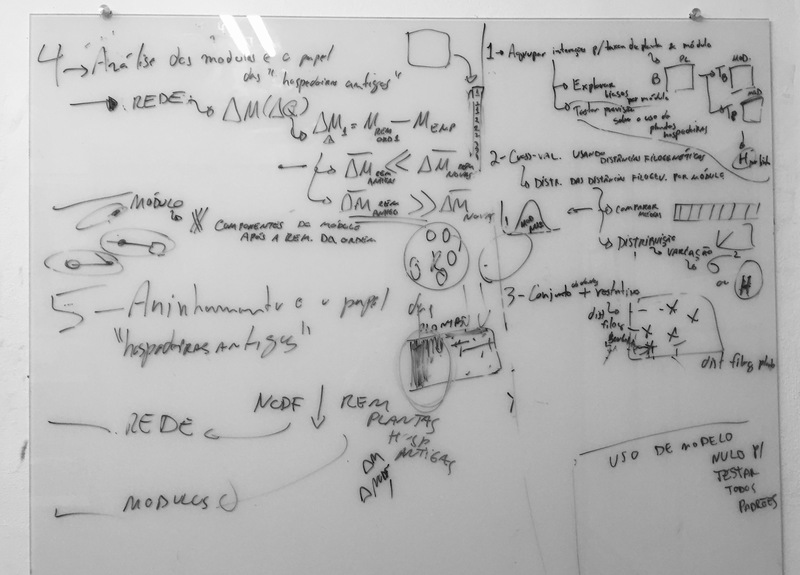 So I visited Paulo and in one very productive afternoon we came up with the analyses we could do to test the main predictions from each scenario (the white board picture shows the result of that afternoon). Later on we added the simulations to validate our verbal arguments. Somehow we made sense of all the ideas Paulo and I threw on the white board. Much to the surprise of all authors, our results were very similar for both the Nymphalidae and Pieridae families of butterflies. This helped us realize that the apparent differences between them resulted mainly from the different ways each butterfly family had been studied, rather than intrinsic differences between them. For me, this paper is an example of how much can be gained when people with different backgrounds sit together and try to find a common ground. I surely learned a lot from this experience. I am a PhD student working with Niklas Janz, Sören Nylin and Fredrik Ronquist. I use a number of different approaches to study the evolution of ecological interactions and diversification of herbivorous insects.